Jeff Brown, a 23-year-old African-American, lives in Milwaukee, Wisconsin, a city deemed among the worst for black Americans to live in. “It feels like I was set up to fail,” Jeff says. He is not alone in this feeling. Born and raised in Milwaukee, Jeff is now an architectural designer at a local firm after recently graduating from the University of Wisconsin-Milwaukee. He is also an alum of St. Marcus Lutheran School, a grade school in Milwaukee’s voucher program that serves primarily low-income and minority students. “I owe everything I am to the support of my family and the educators who were constant guides for me inside and outside the classroom. I don’t know where I’d be without them,” Jeff explained. If, as the research indicates, the most accurate predictor of a student’s achievement is parental involvement in his or her education, and school choice—the reason St. Marcus School exists—encourages parental involvement, then perhaps one way to reduce the achievement gap may be by promoting educational choice policies in America. Maintaining the status quo will ensure Jeff’s story of success remains an outlier. 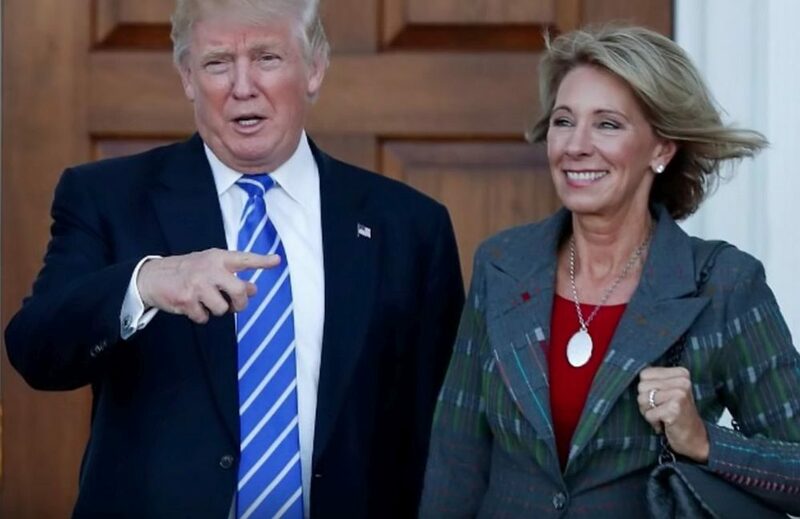 Donald Trump’s electoral victory has generated uncertainty in education reform circles, but his nomination of philanthropist and conservative activist Betsy DeVos, a champion of educational choice and opportunity, offers unprecedented opportunity for meaningful change. There is a great need in America to improve schooling to help remedy the achievement gap that persists along racial lines. Fewer African-American students complete high school, attend university, or graduate college than do their white counterparts. Moreover, evidence suggests that progressive curriculum changes and drastically increased government education spending have not helped in this regard. The 1966 “Coleman Report,” commissioned by Lyndon B. Johnson to assess the state of the racial achievement gap, was the first study to find a huge premium on parents’ influence on their kids’ achievement. It found that time in school accounts for only around 10 percent of the variation in student achievement. As corroborated by later research, the report showed that school input is nowhere near as important as family background because standard American curricula does little to lessen the gap between minority students and their white peers. Although there is research to support the idea that schools cancontribute to closing gaps in achievement that start at home, schools in America too often don’t due to ideological monopolies that oppose effective curricula. St. Marcus is an example of one school that does improve student achievement. As Brown can testify, hardly a week went by where his teachers did not communicate with his parents. St. Marcus understands that what classrooms instill must be reinforced at home to have a lasting effect, and for this reason it requires that all teachers visit the homes of every student. The purpose of this is twofold: to meet the family and build a relationship with them, and to understand the student’s home environment. St. Marcus’ teachers also familiarize parents with what the school expects of their children. They make weekly phone calls to parents, and also has them sign a contract to ensure they will do what they can to support their children’s education at home. “We make parents our partner in their child’s education,” says Morgan Lautz, a sixth-grade math teacher at St. Marcus. “If the students see that their parents and their teachers are on the same page, they feel accountable.” While difficult to legislate, this kind of communication and support between teachers and parents is integral to student achievement. Public policy can help. America’s new chief executive has stated his goals of, through his School Choice and Education Opportunity Act, expanding school choice and restoring local authority. Both will allow schools like St. Marcus to flourish. Although not a panacea, programs that increase education choice can promote parental involvement: by virtue of having a choice of schools, parents become involved and interested in the process of their child’s education. A randomized control trial by the Brookings Institution and Harvard University found that college enrollment for African-American students who were given vouchers in New York City was 24 percent higher than college enrollment among their counterparts in non-voucher public schools. Trump’s presidency and DeVos as education secretary can provide an opportunity for federal education policy to catch up with where state policy has been heading for years. The number of states that offer private school choice has grown over the last decade from nine to 43. More than eight new choice programs were added in 2015 alone. Today, more than 22 states plus the District of Columbia have a voucher program, 20 states have a tax-credit-scholarship program, five states offer Education Savings Accounts (ESAs), dozens more support online courses, and Louisiana lets families choose among individual courses with their tax-funded school dollars. States are leading the way in expanding options for students, but federal flexibility is lagging. Federal funds cannot follow students who take advantage of these state choice opportunities. Making Title I funds for low-income children portable, a feature that the recent No Child Left Behind rewrite lacked, would be a step towards empowering parents to make the best educational choice for their children. Congress can also expand school freedoms by relieving states of many counterproductive federal rules that hamper both public and private schools, and block-granting states their education dollars back without attaching regulations from bureaucrats a thousand miles away. There is ongoing debate about the extent to which the federal government should be involved in education. Based on the federal government’s abominable track record running all education programs, it’s clear that a federal voucher program could be ineffective and even counterproductive by importing federal regulations that hurt public schools also into private schools. However, current federal policy reinforces the status quo, deprives low-income families of flexible and needed financial assistance, and undermines state authority. So it certainly stands to be improved. Federal legislation cannot and should not require all schools to look like St. Marcus, nor can education choice alone remedy the many and complex social and public health issues with which many parents struggle. But all schools with disadvantaged students can benefit from increased parental engagement. Educational choice remains one of the best ways to get parents involved in their children’s education. That’s why there is good reason to be optimistic about Trump’s commitment to seeing choice expand and therefore the potential in every student—regardless of race or socioeconomic background—unlocked.